Why CoolLaser SLT for Glaucoma? Home > Why CoolLaser SLT for Glaucoma? Eye doctors often use a cool, painless laser light treatment known as Selective Laser Trabeculoplasty, or SLT, that takes only 1 minute to perform. And the CoolLaser has been shown in several scientific studies to be just as effective as eyedrop therapy. Most insurance companies cover the CoolLaser treatment. It’s painless and safe for people with Diabetes and Heart Disease — even for people with pacemakers. The CoolLaser doesn’t burn tissue, so it can be repeated whenever necessary. Best of all, you can resume your full activities immediately afterward. Read Dr. Krawitz's interview in EyeWorld Magazine on the benefits of SLT "CoolLaser"
Who is a candidate for CoolLaser? Patients who have primary open angle glaucoma, pigmentary glaucoma, pseudoexfoliative glaucoma and open-angle glaucoma and are in need of lowering of their intraocular pressure (IOP) are eligible for CoolLaser. Patients with narrow or closed angle glaucoma are not eligible. How does CoolLaser work? Laser energy is applied to the trabecular meshwork, which is the drainage tissue in the eye. The exact mechanism of how it works is still unknown, but it seems to start a chemical and biological reaction in the tissue that results in better drainage of fluid through the trabecular meshwork leading out of the eye. In most patients, this results in lowering of eye pressure. Typically, the results are seen as soon as 1 month, but may take up to three months. Why is it called Selective? The type of laser used has minimal heat energy absorption because it is only taken up by selected pigmented tissue in the eye. Because of this, it is known as the CoolLaser. The procedure produces less scar tissue and has minimal or no pain compared with heat lasers. What are the risks? Compared with side effects of eyedrops, including redness, irritation, darkening of eyelids and slowing of heart rate, CoolLaser™ often has fewer side effects. Temporary redness and mild inflammation is common and treated with a non-steroidal eyedrop. A small percentage of patients develop temporary elevation of eye pressure after laser, which can be managed by glaucoma medications and usually goes away after 24 hours. How effective is CoolLaser? SLT lowers eye pressures by about 30% when used as initial therapy. This is comparable to the pressure lowering of the most potent class of glaucoma medication (prostaglandin analogs). This effect may be reduced if the patient is already on glaucoma medications. How long does the pressure lowering last? Most patients experience 1-5 years of pressure reduction, and in rare cases, longer than that. If it does not last at least one year, it is usually not considered successful. What happens if CoolLaser wears off or doesn't work? CoolLaser procedure can be repeated, as it does not cause visible burns to the trabecular meshwork, but if it is not initially successful, repeating the treatment is not likely to be effective. Best of all, CoolLaser doesn't prevent future treatment with eyedrops or surgery. What is the cost? CoolLaser is an FDA-accepted glaucoma treatment, so it is covered by Medicare and other medical insurance companies. The cost for an uninsured individual or with an insurance co-pay will vary. 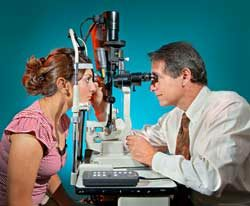 Will I still need to use glaucoma medications after CoolLaser? Some patients can be controlled with just laser treatment. Others require additional eye pressure lowering and may therefore need to use glaucoma medication as well. In general, CoolLaser is equivalent to one glaucoma medication. Just as some patients will require more than one glaucoma medication to control their eye pressures, some may also require laser plus one or more glaucoma medications. It is important to note that CoolLaser is not a cure for glaucoma, just as there is no cure for elevated blood pressure; the goal is to control eye pressure, not cure it.